“Legends Nights” is an on-going program which will honor former players/legends throughout the Magic’s Silver Season. Past honorees include Tracy McGrady, Nick Anderson, Pat Williams, Jimmy Hewitt, Dennis Scott, Pat Garrity, Jeff Turner, Sam Vincent, John Gabriel, Bo Outlaw, Horace Grant, Penny Hardaway and Darrell Armstrong. 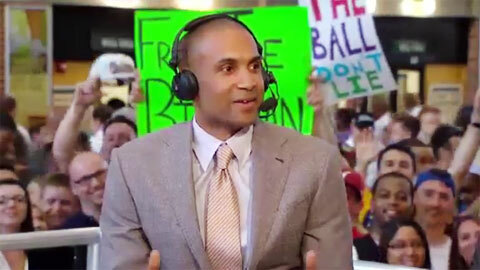 Video shows Grant Hill discussing his retirement. Hill played in the NBA for the Detroit Pistons, Orlando Magic, Phoenix Suns, and Los Angeles Clippers. On June 1, 2013, he announced his retirement from professional basketball after 19 seasons in the NBA. If you would like to book NBA stars like Grant Hill for a speaking engagement, guest appearance, charity fundraiser or special corporate event, you can contact Grant Hill’s booking agent for appearance and speaker fees or call 1.800.966.1380.